I am hanging low. There seems to be a lot to think about. Certainly I have a lot of projects either that need to be started, have been started and need finishing, or new ones to dream up. I feel the need to throw some stuff away. I shall list a whole bunch of stuff on ebay this afternoon. That will cure that itch just fine. There are reports of 10 feet of snow up in Oswego today. They have been getting some serious lake effect snows to be sure. Here is a pic a friend sent me from the ice from atop Mt. Erebus today. The sea ice really moved out this year. It is absolutely amazing. The helos stop flying today until next year and the station is getting ready for another winter. 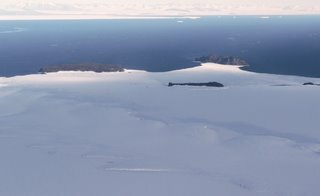 I was asked "Now, does it REALLY get cold in Antarctica, or is that hype?". I think that is a great question. For those familiar with the blog have seen open windows, fans, van heaters not on etc. One of my friends on the ice (who has had lots of ice time) says that Summer in Antarctica (McMurdo) will be nothing like what you expected the weather in Antarctica to be like, on the other hand Winter is a lot worse than what you expected weather to be like in Antarctica. I trust his description. I have seen the photos of a huge oil tank ripped abart by a Herbie (Hurrican Blizzard) a few years ago. In my experience, Antartica is a very cold lifeless place. It can be surprisingly warm in the summer in certain areas (McMurdo, New Harbor) while at the same time up on Mt. Terror or Mt. Erebus a few miles away it may be 70 degrees colder at the same time. It can make for a strange day when you fly up there and back. The warmest I experienced was +40 F at McMurdo. The coldest I experienced was -60 F in the sub-terrainian chambers at South Pole. This is a picture of the first day I arrived on the ice in the Airporter van that yesterday's picture was taken in with some the people I got to meet on the ice. Today here in NY it was -12 F with a pretty good wind. It didn't feel very cold to me. The cold air as it comes into the lungs is quite familiar. The air is much more damp here and the snow is not as crisp as it would be at the same temperature in Antarctica. Even at -12 it feels damp. I do have to get some better winter clothes though. I respect the cold more than I used to. I see folks around here not preparing for the cold at all before they go out into it. I understand that the car will be warm in a few minutes and all that and it it is only a short walk between buildings. I guess the question is why suffer? Not dressing and getting cold even for brief periods is self imposed. If you get cold and you don't want to be cold something is wrong. I wish I could summarize the last 4 months on the ice but that just won't be happening. I guess it was too big of a deal, too much to summarize. I will be trying. I am off concentrating on some financial plans, aviation plans, and generally trying to get back to normal. This picture is a self portrait crossing over to the ice pier. The windows on vehicles and building in Antarctica often crack from the cold and the sun heating them at the same time. I am glad I am home. I am getting used to all the people, activity, darkness and otherwise real life. I seem to have gotten ill between here and the ice. I will be spending more time in bed than I "oughta". Bonnie seems to have saved Calisto the llama' life.